VFP Dissident was kind enough to invite me to contribute to this blog. Like many, I'm incensed by what's going on towards my sisters and brothers in places under the heel of US and Israeli oppression. This will be my little corner on the internet to rant about it. My inspiration for this name: a courageous Arab woman who embraced Islam in its early days, Khawla was a knight and poet. She earned a "reputation of immense bravery, and her legendary personna is still well remembered in Arabia up to this day." And who said Islam oppresses women? The case was brought to the court under the premise that the child was covered by laws protecting all "animals." That premise was recently debunked as an historical myth (Watkins, 1990). That the Little Mary Ellen case was the first child protective service (CPS) court intervention on behalf of a child is also not correct. Although the girl's case was finally addressed by a court of law in 1875, reported criminal cases involving child abuse date back to 1655 (Bremner, 1970, 123- 124, as cited in Watkins, 1990, p. 500). It was also said last night that, until recently, fertile women generally had a child about every year. I think it is illuminating to consider that women in many, if not all, societies had developed herbal and other methods to control their own fertility and this was strongly resisted in patriarchal societies. Some scholars have advanced a compelling argument that the Medieval European witch hunts were motivated, in part, by the desire suppress female control of female fertility (see esp. "The Elimination of Medieval Birth Control and the Witch Trials of Modern Times" by Gunnar Heinsohn and Otto Steiger in the International Journal of Women's Studies, 3, May 1982, 193-214 and "Population, Conquest and Terror in the 21st Century" by Gunnar Heinsohn). Barbara Ehrenreich and Deirdre English have written "Witches, Midwives, and Nurses: A History of Women Healers", which also sheds light on the patriarchal suppression of women healers in Medieval times. The time of early Renaissance Europe, with the extreme losses of labor in the wake of the Little Ice Age and the Great Plague, brings about the Great Witch Hunt. Its content is the repression of the highly developed culture of artificial birth control of the Middle Ages, especially contraception and abortion, which in late medieval and early modern times deprives feudal and ecclesiastical lords of the manpower required to regain economic prosperity. Its target are the foremost experts of medieval birth control, the “midwives = witches”. The thesis is discussed with respect to ecclesiastical and secular laws of the 15th and 16th centuries punishing all forms of birth control, the disappearance of medieval birth control knowledge in early modern times, and the dramatic rise in birth rates leading to the European Population Explosion of the 18th century. While the midwives are the prime target during the Great Witch Hunt, suppression of contraception and abortion continues after the end of the persecutions by other methods, making knowledge of birth control the great taboo of the Occident until the 1960s. The following is reposted from wartaxboycott.org. For over five years peace activists have voted, lobbied, marched, and taken direct action to first prevent and then end the war in Iraq. Courageous soldiers have refused to fight the war. But Congress repeatedly votes to appropriate billions of dollars to continue the war and appears ready to authorize a future military attack on Iran. It’s time for taxpayers who oppose this war to join together in nonviolent civil disobedience and show Congress how to cut off the funds for this war and redirect resources to the pressing needs of people. 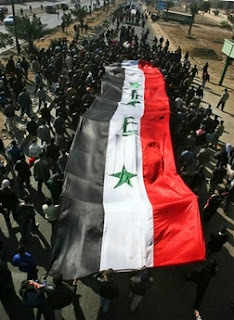 The organizers and signers of the 2008 War Tax Boycott urge all who oppose this war to register and prepare for an April 2008 nationwide boycott and redirection of the federal income taxes that fuel the war in Iraq. If you are new to war tax resistance, you will find the information you need to get started on this website, or you can check off that you need more information when you register. We urge those who are already refusing to pay for war (whether by reducing their income or not paying some or all of taxes due) to sign on also. The more who sign on, the louder our voices will be in Washington as we demand an end to war and show Congress how to use our money for life affirming programs. This campaign was initiated by the National War Tax Resistance Coordinating Committee and is being promoted by Voices for Creative Nonviolence, War Resisters League, the National Campaign for Nonviolent Resistance, Veterans for Peace, and the Nonviolent Direct Action Working Group of United for Peace and Justice. 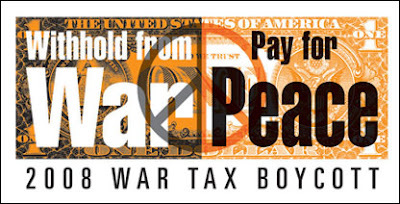 This campaign to boycott and redirect war taxes was launched in September 2007 as Congress began its consideration of a Bush Administration request for an additional $190 billion appropriation for the wars in Iraq and Afghanistan. It was begun in the fall, ahead of tax season, so that those who want to refuse to pay for war could explore the options, decide what to do, and prepare to resist well before 2007 taxes are due. The campaign is being promoted by peace activists around the country and is partnered with CODEPINK's “Don't Buy Bush's War" campaign. Iraqi kids are happy and the sun is shining on our Mesopotamia again! So now the only tiny remaining problem of the flag's design is being resolved. Bless the Iraqi government and its sense of priorities. 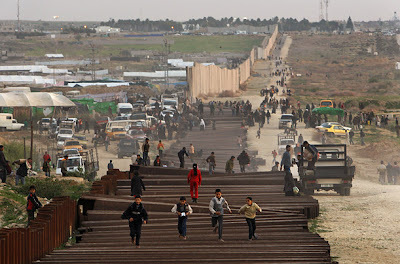 To the joy and relief of people around the world, Palestinians in Gaza took nonviolent direct action early yesterday and, for the moment, ended Israel's crushing and criminal blockade of the territory by tearing down large sections of the Israeli-constructed wall separating Gaza and Egypt. The Israelis and their Fatah collaborators were not so happy. See also "Gaza" on No Snow Here. 935 Bush Lies & Are Palestinian Collaborators Jewish? Below are the two lead paragraphs from "False Pretenses" by Charles Lewis and Mark Reading-Smith of The Center for Public Integrity. They are not so crass as to refer to the "935 false statements" as lies but I am. I think any reasonably thoughtful and intelligent person realized at the time that Bush and pals were telling lies. That, of course, rules out most of the mainstream media and Congress. Attorney Nathan Schreiber said he receives many requests for help from former collaborators who live in Sderot. "Naturally they're very concerned about the situation. They may ethnically be Palestinians but there is Jewish blood in their veins. In my talks with them they keep saying that Israel is not doing enough to stop the Qassams. They follow the strife inside Gaza and have said that in their opinions – the rocket attacks will only stop once the factional violence in Gaza ceases." The January issue of Scientific American has an article by Dan Fagin entitled "Second Thoughts on Fluoride." You can go out and buy the magazine, read it at the library, or purchase the article online at the Sci Am web site here for $4.95. Below are highlights and excerpts of the article reposted from the Fluoride Action Network. • Researchers are intensifying their scrutiny of fluoride, which is added to most public water systems in the U.S. Some recent studies suggest that overconsumption of fluoride can raise the risks of disorders affecting teeth, bones, the brain and the thyroid gland. Page 75: Most fluoridated water contains much less fluoride than the EPA limit, but the situation is worrisome because there is so much uncertainty over how much additional fluoride we ingest from food, beverages and dental products. What is more, the NRC panel noted that fluoride may also trigger more serious health problems, including bone cancer and damage to the brain and thyroid gland. Although these effects are still unproved, the panel argued that they deserve further study. Page 75: TOO MUCH OF A GOOD THING: Fluoride is in many foods, beverages and dental products. The ubiquity of the cavity-fighting chemical can result in overconsumption, particularly among young children. Page 78: Scientific attitudes toward fluoridation may be starting to shift in the country where the practice began. Page 80: Clashes over the possible neurological effects of fluoride have been just as intense. Phyllis Mullenix, then at the Forsyth Institute in Boston, set off a firestorm in the early 1990s when she reported that experiments on lab rats showed that sodium fluoride can accumulate in brain tissue and affect animal behavior. Prenatal exposures, she reported, correlated with hyperactivity in young rats, especially males, whereas exposures after birth had the opposite effect, turning female rats into what Mullenix later described as “couch potatoes.” Although her research was eventually published in Neurotoxicology and Teratology, it was attacked by other scientists who said that her methodology was flawed and that she had used unrealistically high dosages. Since then, however, a series of epidemiological studies in China have associated high fluoride exposures with lower IQ, and research has also suggested a possible mechanism: the formation of aluminum fluoride complexes—small inorganic molecules that mimic the structure of phosphates and thus influence enzyme activity in the brain. There is also some evidence that the silicofluorides used in water fluoridation may enhance the uptake of lead into the brain. The optimal range for daily intake of fluoride—the level that maximizes protection against tooth decay but minimizes other risks— is generally considered to be 0.05 to 0.07 milligram for each kilogram of body weight. Consuming foods and beverages with large amounts of fluoride can put a diet above this range. Below are typical trace levels of fluoride, measured in parts per million (ppm), found in foods and drinks tested at the University of Iowa College of Dentistry. I was watching the documentary film The Camden 28 last night. When they flashed a sound bite from Lyndon Johnson I was reminded of the ongoing Israeli and American propaganda campaign against Iran and especially the most recent episode where large, modern, heavily armed American warships go half-way around the world, steam in or near Iranian territorial waters, and then complain because Iranian speedboats are "threatening" them. Aggression by terror against the peaceful villages of South Vietnam has now been joined by open aggression on the high seas against the United States of America. US President George W. Bush on Tuesday blamed Tehran for a "provocative" weekend face-off between US and Iranian ships as he prepared to take his warning that "Iran is a threat" to the Middle East. "We viewed it as a provocative act. It is a dangerous situation and they should not have done it, pure and simple," Bush declared in his first public remarks on Sunday's incident in the Strait of Hormuz. Shortly after he spoke, the Pentagon released a video and audio tape that appeared to confirm its charge that Iranian speedboats swarmed three US warships in the Strait and radioed a threat to blow them up. "My message today to the Iranians is, they shouldn't have done what they did," he added. "I don't know what their thinking was, but I'm telling you what I think it was, I think it was a provocative act." WASHINGTON (Reuters) - Iranian boats aggressively approached three U.S. Naval ships in the Strait of Hormuz, a main shipping route for Gulf oil, at the weekend and threatened that the ships would explode, U.S. officials said on Monday. Iran dismissed U.S. concerns about the incident, saying it was a routine contact. But the Pentagon termed the Iranian actions "careless, reckless and potentially hostile" and said Tehran should provide an explanation. "This is a very volatile area and the risk of an incident escalating is real," U.S. Defense Secretary Robert Gates said. "It is a reminder that there is a very unpredictable government in Tehran." WASHINGTON, Jan 15 (IPS) - Senior Pentagon officials, evidently reflecting a broader administration policy decision, used an off-the-record Pentagon briefing to turn the Jan. 6 U.S.-Iranian incident in the Strait of Hormuz into a sensational story demonstrating Iran's military aggressiveness, a reconstruction of the events following the incident shows. The initial press stories on the incident, all of which can be traced to a briefing by deputy assistant secretary of defence for public affairs in charge of media operations Bryan Whitman, contained similar information that has since been repudiated by the Navy itself. Then the Navy disseminated a short video into which was spliced the audio of a phone call warning that U.S. warships would "explode" in "a few seconds". Although it was ostensibly a Navy production, IPS has learned that the ultimate decision on its content was made by top officials of the Defence Department. The Bush administration concocted or hyped a threat where no real threat existed. Who ever heard of such a thing? No matter, millions of American sheeple won't care, won't know, or, more likely, both. If they report it at all, the mainstream media will not give the hoax revelation anywhere near as much attention and prominence as the initial story garnered and the Bush administration and the Israel Lobby will continue to make hay with it. As the Associated Press reports today: "The push to contain Iran has been given new urgency by an incident in the Persian Gulf this month in which U.S. warships were harassed by the Iranian naval speedboats in the Strait of Hormuz." Just when it looked like Israel was about to fail in its efforts to convince the world about the dangers posed by Iran, the Iranian regime itself stepped in to help Israel make its case. There is a reason American military officers express grim concern over the tactics used by Iranian sailors last weekend: a classified, $250 million war game in which small, agile speedboats swarmed a naval convoy to inflict devastating damage on more powerful warships. In the days since the encounter with five Iranian patrol boats in the Strait of Hormuz, American officers have acknowledged that they have been studying anew the lessons from a startling simulation conducted in August 2002. In that war game, the Blue Team navy, representing the United States, lost 16 major warships — an aircraft carrier, cruisers and amphibious vessels — when they were sunk to the bottom of the Persian Gulf in an attack that included swarming tactics by enemy speedboats. If the war game is "classified" then that means the results have been leaked, undoubtedly with Bush adminstration connivance. And you have to get more than halfway into the article to learn that "The Blue Team defenses also faced cruise missiles fired simultaneously from land and from warplanes, as well as the swarm of speedboats firing heavy machine guns and rockets." Thanks New York Times for helping the Pentagon salvage a story that was fast going down the toilet by raising the specter of a swarm of boats firing rockets and backed by aircraft and cruise missiles where before only five Iranian speedboats existed. More than three years ago, I sent out a message about the American Arab Anti-Discrimination Committee's (ADC) March 2004, Action Alert: "Demand Merriam Webster Correct Definition of 'anti-Semitism' ". Here's part of what I wrote back then: "I heard about this a couple of days ago ... I simply did not believe it at first. ... I also called the library today and asked the librarian to read me the definition of "anti-Semitism" in Webster's Third New International Dictionary. They had the 1993 edition and the definition she read to me was almost exactly the same as the one that appears below." This story was covered by the Washington Post in 2004 (you can find a copy of "Dictionary Urged to Delete 'False' Definition of Anti-Semitism," archived by the ADC here). But before that the Israeli Ministry of Foreign Affairs cited the definition approvingly in 2001 as part of an orchestrated propaganda offensive against the World Conference against Racism in Durban, South Africa. The good news is that Webster's may fix the problem. According a 2005 article in the Jordan Times, quoting spokesperson Arthur Bicknell, "it is 'highly likely' that the next version of this dictionary will not include any reference of Zionism in the definition. He noted that the collegiate desk version of the dictionary has never included this less-used sense of the word." it is a simple matter for Merriam-Webster to begin to correct the error and repair the damage by issuing a public statement which repudiates senses two and three. e) Stigmatizes perfectly legitimate political opinions and activities." But they can’t, they don’t and they didn't. And the *reason* why, is because of the MARKET. How could Black people own slaves and live in a beautiful plantation house when they were busy being forced to participate in the market as animals and live stock to be sold for profit for the Master? Her remarks are part of a discourse on an Audre Lorde speech wherein she famously claims "... the master’s tools will never dismantle the master’s house." This discourse is, in turn, a part of BFP's critique of a blog post by Hugo Schwyzer. Below is a comment I've tried twice to post to BFP's blog. The first time there were only 4 or 5 comments and the second time there were 31. When I last checked, there were 52 comments but mine was not among them. I've had comments posted to her blog before and so it's hard not to conclude that BFP is using her brown, femi power to squelch a view she doesn't want on her blog, which is certainly her right. Any way, below is a slightly edited version of my comment. I've now added some formatting and links and taken out the quote from BFP that appears above. Ummm, but Black people did own slaves. As Larry Koger notes in Black Slaveowners, "In Louisiana, Maryland, South Carolina, and Virginia, free blacks owned more than 10,000 slaves" in 1830. According to Philip Burnham, that same year, throughout the South 3,775 free Blacks owned 12,760 slaves. He also notes that Blacks in several states of the North still owned slaves in 1830, too. One of the first people in North America to own another person as a chattel slave for life was a Black man. According to Burnham, in 1655, a Virginia court ruled that John Casor, against his will, was the permanent property of Anthony Johnson. In the early 1800s Anna Madgigine Jai Kingsley was enslaved in Africa at the age of about 13 and brought eventually to North America. Her master made her his wife and when she and her children were freed in 1811 she went and bought her own slaves to run her own plantation in addition to helping run her husband Zephaniah's plantation, which upwards of 200 slaves. I've visited the plantation, it's just north of Jacksonville, FL. Anna Kingsley and others owned slaves because they often came from slave-owning cultures in Africa and because they could. I would now add two things: In Anna Kingsley's will of 1860, she left four slaves to her daughter--they were all under the age of 18. Slave ownership by Blacks in America is not only explained by their roots in slaveowning cultures in Africa but also by their roots and experiences in a slaveowning culture in America. That's kind of what I was getting at when I said "they could" but the matter deserves some clarification. I meant to post the statement below before Christmas but I didn't have the time and energy to track it down and when I did it wasn't real easy to find but here it is. You can find the text with the list of signers here (PDF). During these joyful holidays we write to you, our Christian neighbors all over the world, to express our thanks for the beautiful and gracious responses that we Muslims have been receiving from the very first day we issued our invitation to come together to ‘A Common Word’ based on ‘Love of God and Love of Neighbor’ (see www.acommonword.com for the document and the responses). We pray, during these blessed days, which have coincided with the Muslim feast of the Hajj or Pilgrimage, which commemorates the faith of the Prophet Abraham (peace be upon him), that the New Year may bring healing and peace to our suffering world. God’s refusal to let Abraham (peace be upon him) sacrifice his son—granting him instead a ram—is to this day a Divine warrant and a most powerful social lesson for all the followers of the Abrahamic faiths, to ever do their utmost to save, uphold and treasure every single human life and especially the life of every single child. Indeed, it is worthy of note that this year Muslim scholars issued a historic declaration affirming the sanctity of human life—of every human life—as an essential and foundational teaching in Islam upon which all Muslim scholars are in unanimous agreement (see details at www.duaatalislam.com). This is post is an edited version of a message I sent a while ago to a seminar I am part of. B. asked me about some things I said last night about one of the wives (although even her spousal status is, apparently, disputed) of Mohammed. She was known as Marya al-Qibtiyya (or Mariya/Maria the Copt) , i.e. a Coptic Christian, and is believed by some scholars to have played a role in the origin of Islamic reverence for Isa, a.k.a. Jesus. I can't remember where I first learned about this but I'll provide a couple of sources for anyone interested in pursuing this line of inquiry. For one brief (pro-Western) Islamic perspective, see "Maria The Copt" . Another brief Islamic perspective can be found here. For an anti-Muslim, pro-Zionist, anti-Roman Catholic, fringe, evangelical Christian perspective that mentions Marya, see Jack Chick's comic/graphic novel The Prophet which is described as follows: "Part VI of Alberto Rivera's testimony. Learn how the papacy helped start Islam, only to have this new daughter rebel against her. You'll understand the Arab's place in Bible prophecy." Chick's stuff is nothing if not interesting and you can learn a lot from it but it's poison, too. So, be careful. Using a search engine you can find other online sources. Google turns up two scholarly articles that may or may not bear on the influence of Marya on the Qur'an: "A Possible Coptic Source for a Qur'anic Text" by Wilson B. Bishai and a review of Women in the Quran, Traditions, and Interpretation by Barbara Freyer Stowasser. These are both in JSTOR. I may have learned about Marya in The Veil and the Male Elite: A Feminist Interpretation of Women's Rights in Islam by Fatima Mernissi but I doubt it. I can say for sure that I recommend the book to anyone interested in Islam and feminist perspectives on Islam from an Islamic and feminist point-of-view. Yes, there are feminists in Islam and Mernissi's book has some wonderful stuff in it about A'isha, another wife of Mohammed and another remarkable Muslim woman, Sukayna, who married five or six husbands and "never pledged ta'a (obedience, the key principle of Muslim marriage) to any of them." I also heartily recommend Thinking Past Terror: Islamism and Critical Theory on the Left by Susan Buck-Morss. Correction: Jack Chick's comic/graphic novel The Prophet does not mention Marya. According to the narrator, Alberto Rivera, Mohammed's first wife Khadijah, not Marya, was a devout Roman Catholic who was sent on a mission to influence Mohammed. Addendum: FWIW, there appears to be no widely-accepted standard English-language encyclopedic reference work on Islam. The 17-volume Encyclopaedia of Islam is apparently edited exclusively by Western non-Muslims (?) and, according to one review, it is "In many ways ... a quintessential expression of traditional European orientalism, with all that it implies for both good and bad." In any case, the Encyclopedia of Islamic Doctrine (2:163) lists Marya among the wives of Mohammed with the following after her name: "suriyya (concubine)". This is the only mention of her in the 7-volume work. In the wake of her recent assassination, Benazir Bhutto is being touted in the West as the first woman to lead a predominantly Muslim country and so on. Typical is the remark of Joe Pascal on the US N&WR web site: "the first woman leader in the Muslim world" or at feministing.com: "Bhutto was the first woman to lead a Muslim country." The only problem is that it's not true. Long before Bhutto came on the scene there was Shagrat al-Durr, who became the Sultan of Egypt in 1250 AD and I'm sure that more knowledgable people could cite other early female leaders of predominantly Muslim countries. A'isha, the wife of the Prophet Mohammed, was an amazing leader of Muslim people although she never had formal authority like Shagrat al-Durr or Benazir Bhutto. To learn more about A'isha, I recommend The Veil and the Male Elite: A Feminist Interpretation of Women's Rights in Islam by Fatima Mernissi. Bhutto was, of course, the first elected female national executive of a modern Muslim majority nation-state. And it is interesting to me that, arguably, Muslim countries have a rather better track record in this regard than Christian majority countries. See the table below. This is my original research and I welcome corrections. 1. The plus symbol (+) indicates that the country has a Christian majority population while the asterisk (*) indicates a Muslim majority. 2. All population figures are from the CIA's World Factbook.